This is the 4th installment in a series by Virginia Cornwell, a Columbus Ohio Divorce Attorney and Ohio State Bar Association Certified Family Relations Specialist. Virginia is one of approximate 100 attorneys in Ohio to have received this honor. This article is about the process and options for ending your marriage in Ohio, and about Ohio divorce laws. When you have decided to end your marriage, and have concluded that divorce is your best option, there are some things you need to think about before you file your divorce papers. If domestic violence has been part of the history of your marriage, or if you have ANY doubt as to whether you will be safe when your spouse learns you have filed divorce papers, you need to make a safety plan for yourself, and if applicable, your children. This applies to husbands as well as to wives. If your safety and/or the safety of your children was threatened, you should consider seeking a Domestic Violence Protection Order, also known as a Civil Protection Order. It is IMPORTANT to note that these protection orders are ONLY for instances when you have been threatened or have been a victim of domestic violence. A Domestic Violence Protection Order is not something you request simply because your spouse might be angry when they learn you have filed for divorce. It is not a tool to be used to gain custody of the children or exclusive use of the marital home. Domestic Violence Protection Orders are for victims of domestic violence. To read more about domestic violence, click this link to see our post regarding Domestic Violence. Ohio Rule of Civil Procedure 75 gives the court the authority, in divorce, annulment or legal separation proceedings, to enter temporary restraining orders. In some counties Temporary Restraining Orders are automatically made by the court when a divorce case is filed, and they are effective upon both the husband and wife. In other counties, Temporary Restraining Orders are part of the county’s local rules or procedure, and are automatically in effect when the Complaint for Divorce is filed, again, effective against both the husband and the wife. 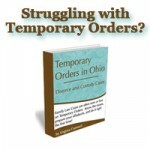 In Franklin County, either you or your Columbus Ohio Divorce Lawyer must file a Motion and Affidavit asking for the Temporary Restraining Order, and submit a proposed Entry to the Judge for signature, and the restraining order is only in effect upon one party (each party must seek their own temporary restraining order against the other). Depending on your county’s procedure, this restraining order may become effective upon YOU at the same time it becomes effective on the other party. That means you will not have access to any funds except funds in a checking account. In addition, if the only checking accounts you have are joint checking accounts, your spouse has the legal right to drain the entire account. You are going to need a checking account, in your own name, to use while you are going through the divorce. In addition, if you have assets which you will need to access during the divorce, you are going to need to put them in a place where they will be accessible during the divorce – a checking account. If you need to take loans to help pay for your divorce, you are going to need to take them BEFORE either party files for divorce, because if you do so after you are under a temporary restraining order, you will have violated a court order and be subject to contempt of court. In addition, when one party files for divorce, BOTH of your credit scores are likely to drop, making credit more expensive. Keep in mind, preparing for temporary restraining orders is NOT about hiding money. Wherever you open your new checking account, and any money that you put in your new checking account will need to be disclosed when you file for divorce. It’s not about hiding money, it’s about having it available when you need it.